On the 19th February, Nyanyian Dharma, a renowned music group from Bali (Indonesia), visited our centre, as part of their all India tour "Dharma Ashram Yatra". 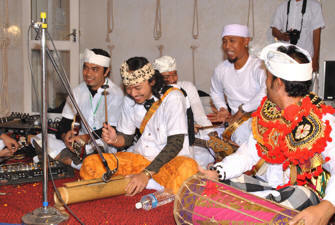 They offered a wonderful and amazing performance, accompanied by several indigenous musical instruments, including gamelan, a typical Balinese orchestra of tuned percussions. The group visited India under the guidance of I Nengah Arnawa (Reagent of Bangli, Government of Indonesia) and Agus Indra Udayana (President of Ashram Gandhi Puri, Bali) as part of a joint undertaking by the Indian and Indonesian Governments to build a beautiful Balinese temple "Bali Dwipa Pura" and cultural centre in Rishikesh. 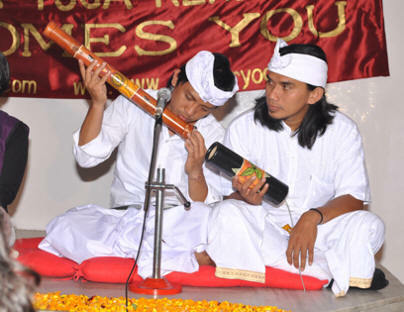 The well-known singers and musicians, under the direction of Trie Utami (well-known singer, composer, song-writer and music director) Ayu Lakshmi (a multi-talented artist, vocalist and dancer) and Dewa Budjana (famous guitarist) captivated the audience with beautiful religious songs, hymns and mantras, both in Sanskrit and Balinese. On the 20th February, the focus was on a cultural fusion between India and Bali. As part of the program, Kumari Somashekhari (director of Omkarananda Natya Kala Academy) presented Indian Devotional dances dedicated to Lord Krishna, Lord Shiva and the Divine Mother. 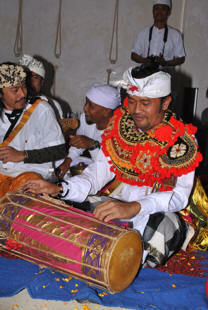 Various Balinese Temple dances were presented by Agung Rama, a student from Ashram Gandhi Puri, Bali. H.H. Swami Vishveshwarananda, President of Omkarananda Ashram Himalayas, gave vote of thanks and presented a shawl to all artists. The great devotion and the aesthetic choices rendered all performances very successful.